Pakistan has become the latest country to join the UIPM Global Laser Run City Tour circuit after a successful first outing in the city of Lahore on November 8, 2018. One of the central aims of the GLRCT is to introduce UIPM Sports to urban populations who would otherwise have no access to the multi-sport movement. 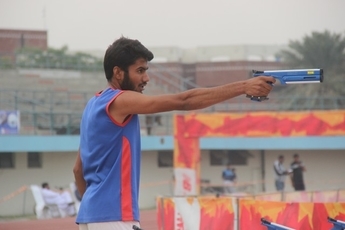 With a sprawling population of 11 million, Lahore was the ideal place for the Pakistan Modern Pentathlon Federation (PMPF) to launch Laser Run to new communities. The event at Punjab Football Stadium attracted 254 participants, with athletes coming from various schools and colleges. A spokesperson for the local organising committee said: “All the athletes participated with great enthusiasm. School officials were encouraged to participate in an inter-school championship that will be organized by PMPF in future.